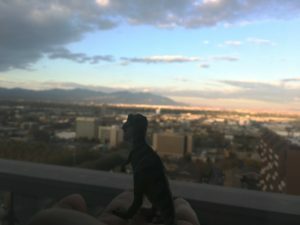 In mid-October, I spent a week in Salt Lake City, Utah with many of the world’s paleontologists for the annual meeting of the Society of Vertebrate Paleontology (SVP). Earlier this year I went to a conference, called PaleoFest, at the Burpee Museum in Rockford, Illinois. And in June I went to Bethesda, Maryland (where I grew up) for the International Congress of Vertebrate Morphologists (ICVM). The Wasatch mountains of Utah. As these weeks happened, I did not blog about them for two very good reasons. First, a lot of the science that is described at these meetings is brand new and not yet published. Publishing a study in a scientific journal includes with it a process of review, in which other scientists check the work to make sure that there are no major flaws with the methods or conclusions of the study. If it passes this important check, then it gets published. I like to wait for papers to be published before I talk about them here: 1) because peer review weeds out studies that may need some more work before publishing, and 2) because if those studies are about to be published, I do not want to break the story here before the journal puts the paper out because I can potentially ruin someone’s hard work by talking about it before the journal gets to. Today, I will talk about what it’s like to go to one of these conferences. Many months before the conference, I submit an abstract (a short, but complete, description of my study) to the conference organizers. They read it and decide whether it should be a talk or a poster presentation. I usually prefer a talk, but I have also presented posters before. 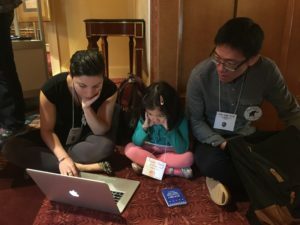 Practicing my talk with some very important people: Jack Tseng and his daughter, Arura (posted with permission). Once the conference starts, I get to look through the program and figure out which talks and posters I want to see. This is an important step since there are 4 talk sessions happening at the same time on different topics. The poster sessions happen in the afternoons, once the talks are over for the day. After a busy day of watching talks and looking at posters, there are social events to attend. The first night at SVP is the Welcome Reception, which usually takes place at the local Natural History Museum. This year, it was at the [Natural History Museum of Utah]. 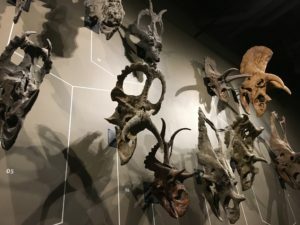 The ceratopsian wall at the Utah Museum of Natural History. It shows the diversity in horns and frills and their evolutionary relationships at the same time! Other nights include the Student Roundtable Forum, where students can get information on a variety of different topics (like How to Get into Grad School), and the Auction, which has a different theme every year. The last night has the Awards Banquet, where we celebrate the achievements of the entire society, and hand out a handful of awards for different aspects of our work – like best 2D/3D/scientific art, best student paper in our journal, and highest overall contribution to the society. The whole week is super busy, but really informative and fun. We get to see the new projects everyone is working on, start new collaborations, catch up with old friends, and see a new city. 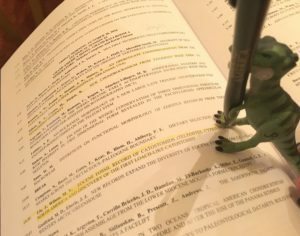 Local conferences are just as fun and smaller in scale, so if you want to get into paleontology, see if you can find a local conference to attend.